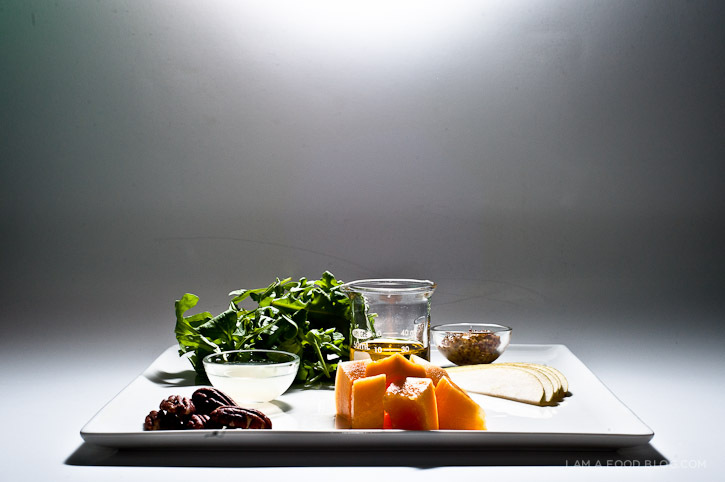 Arugula is one of my top choices in greens for a salad. Those nutty, peppery leaves are so addictive that sometimes I’ll just grab a handful to snack on. Still, not everyone has the same unabashed love for arugula. 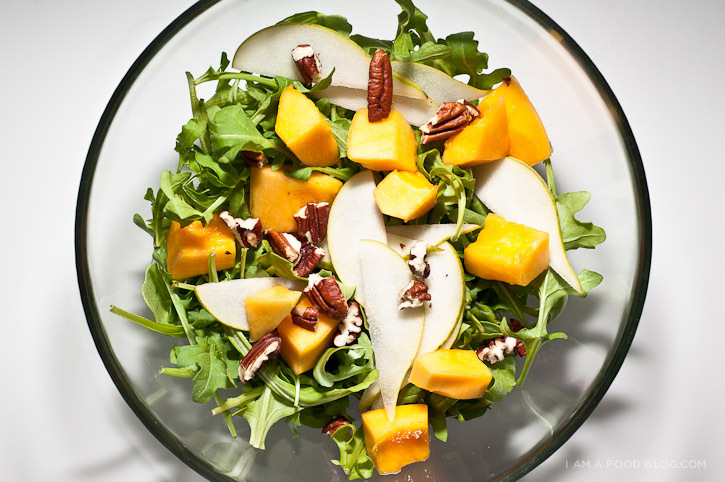 I haven’t tried this, but I don’t think that plopping down a bowl of undressed arugula at my next dinner party will elicit the same amount of enthusiasm as, say…a bowl of papaya pear arugula salad. The key to salads, I think, is light dressing and a good mix of textures and colours. I have a formula I follow whenever throwing together a salad: greens, fruit, nuts and if I’m feeling like I need something a little extra, a bit of cheese. Each component is there for both taste and texture. The fruit for sweetness and yielding softness and the nuts for richness and crunch. This salad is great as a side for fish, or if you’re like me, just on it’s own. 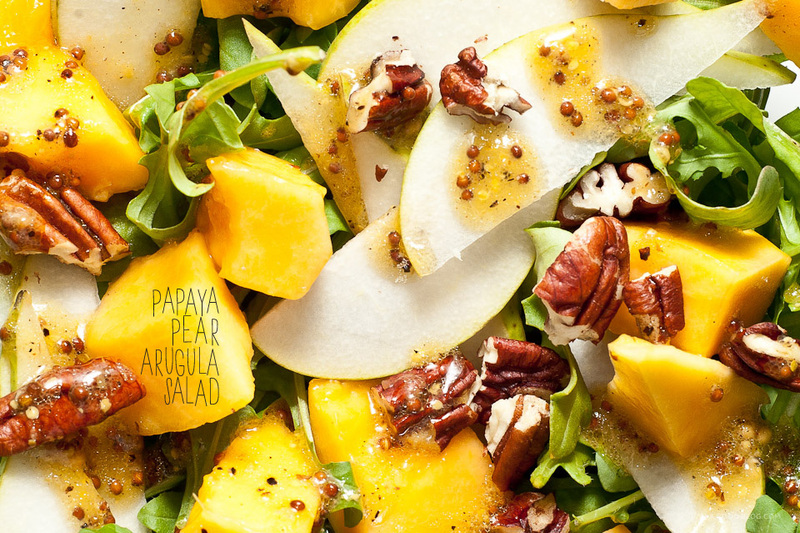 The pepperiness of the arugula pairs well with the melting sweetness of the papaya. 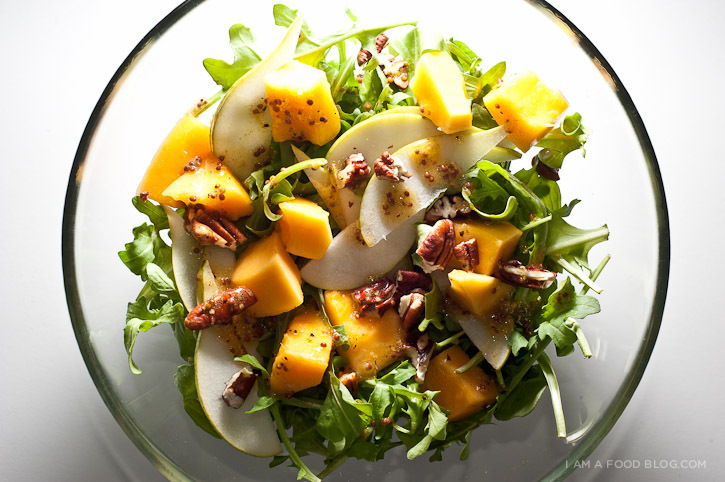 Toss it all in a lime-mustard vinaigrette with thinly sliced pears and toasted pecans and you have a super light, refreshing treat. This salad reminds me of spring, which will hopefully be on it’s way soon. It’s still grey and rainy here in Vancouver and there was even a small sprinkling of snow yesterday! No worries though-I’ll be holed up, eating bowls and bowls of this salad, stubbornly pretending that it’s a sunny, crisp spring day outside. 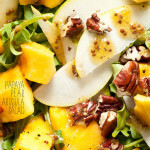 I am peppery, I am fresh: I AM PAPAYA PEAR ARUGULA SALAD! Whisk the vinaigrette ingredients together. 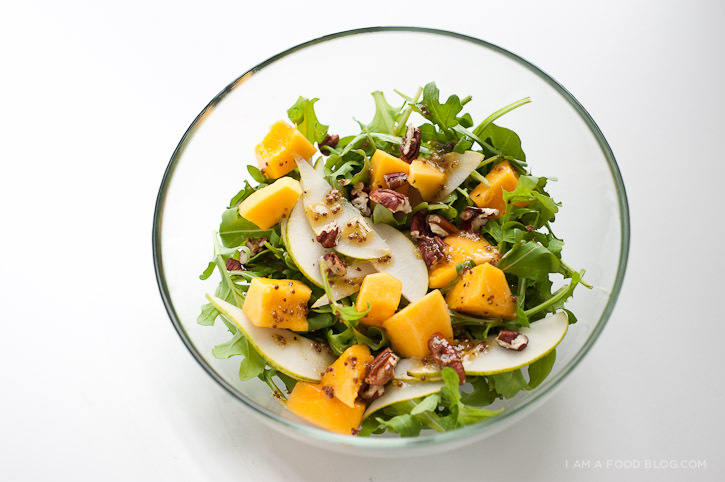 Toss the arugula, pear, papaya and pecans and toss with dressing. Enjoy immediately. Well now, that dressing is absolutely gorgeous! It alone makes me want to eat this, and the bright fruit only helps! I love this salad! I’m making this for sure, just not sure when. Alright – I’m addicted :) Had to subscribe to your RSS feed….looking forward to what’s next on your blog! Well, what the hell you waiting on? Joanne. I have a raging lesbian crush on your blog and images. thank you. Hi. I’m not a mustard fan. Is there any other dressing you would recommend for this salad. You could try it without the mustard and just do a lime vinaigrette. It won’t have as much body, but it should taste pretty good. If you’re not a huge fan of mustard, you should really try stone ground. I never used to like mustard either and stone ground is a bit more mild in taste. Hope that helps!